Jonathan Frank’s father drove a WW2 jeep home from the war. He drove from California to North Carolina. Once home he parked it in a barn on the farm and said he would never drive it again. However, his son, Jonathan and his brother, drove the jeep on the farm. Over the years he has rebuilt it at least three times. The most recent rebuilt was initiated when his own son blew the rear differential. Jonathan admits that the jeep is a work in progress and that it is only about 80 percent original. The winch on the front was a gift from his brother’s old jeep. He also purchased some disc brakes from me. One thing for sure I bet Jonathan has a blast driving the jeep! For a few more pictures look here. You might be interested in learning more about WW2. Eyewitness to World War II: Unforgettable Stories and Photographs From History’s Greatest Conflict gives a glimpse into the personal lives from the war. You will find personal letters and rarely seen photos. It’s a very interesting book. Were there more than one T-84 derivative? I just love the T-84 jeep transmission. But was it used in any other vehicles? The short answer is yes! This question comes up fairly often so I’m repeating a previous post for the newer folks. Also, the T-84 was used in the Studebaker Weasel. The T-84 was not just used in the WW2 jeep. The jeep used the T-84J. Below are listed several (but not all) of the various vehicles that used a T-84. I didn’t bother to list them but there was at least one car, a Studebaker, that used a T-84 after the war. Information extracted from The Hollander. The T-84 gets a rap for being a bad and weak transmission. You have to wonder why it was used in some many cars (and trucks!) for so long a period of time if better transmissions were available. For more about the T-84 WW2 jeep transmission, check out my book – Trouble Shooting And Rebuilding The T-84J. You really can rebuild a WW2 jeep transmission. Now if you get fed up with your old Carter and Solex carbs, you might consider purchasing a brand new reproduction Carter made by Joe’s Motor Pool Jeep Parts. Various retailers sell the carbs. I didn’t have any luck with the new Carter but I suspect it was because my manifold was also screwed up. Grandpa’s War Pony is available from Amazon.com and other booksellers. 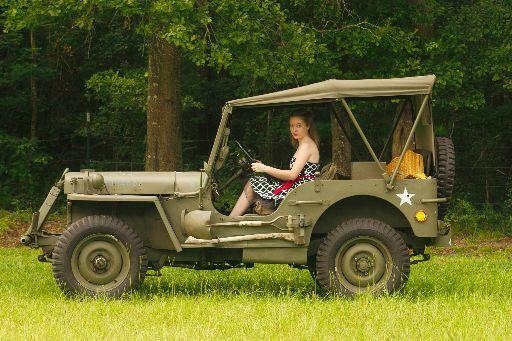 Got WW2 Jeep? You Need this List! Army Jill, my mechanic always uses the SNL G-503 to confirm parts for the WW2 jeep. Army Jill, my mechanic always uses the SNL G-503 to confirm parts for the WW2 jeep. It is one of the most important books you can have when ordering parts for your old World War Two military jeep. Well, the Internet is a wonderful thing. If you look hard enough sometimes you will find just what you are looking for. Well, I wasn’t looking for it …but I found it anyway. If you haven’t purchased a copy of the SNL G-503 parts list for the Willys MB and Ford GPW then you are in luck. You can find a copy on the Internet Archive! Now it isn’t the complete book, the cover and a few minor pages appear to be missing but the book is still usable. 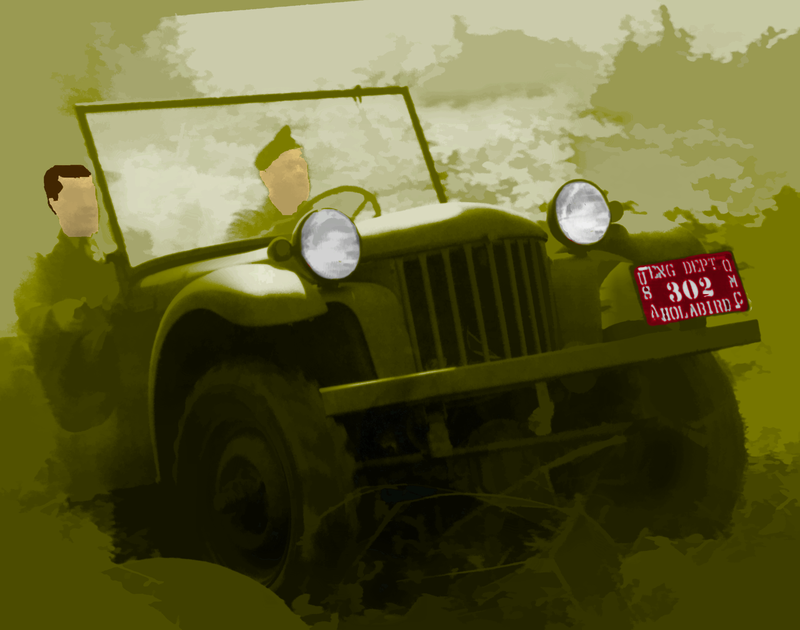 You can also find other WW2 jeep related books on the Internet Archive. Just dig around a little bit and you will find them. Sometimes it is handy to have an electronic copy around even when you have the real thing in hand. Makes it easier to pose your question when you have a picture or a page of information to go with it! Check out the Internet Archive, it is a great resource. You may be interested in a book I’ve written that is available from Amazon.com and other booksellers. It is a children’s book discussing the WW2 jeep, it’s called Grandpa’s War Pony . Check out our website 42FordGPW and support our sponsors by clicking on their ads. 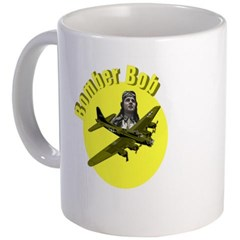 Bomber Bob Mug: Small and Mega Size! After a long drive in the jeep, I like a good cup of joe, don’t you? Bomber Bob flying aboard his B-17 during WW2. Makes a great coffee cup for you! Bomber Bob and his trusty B-17 of the U.S. Army Air Forces during WW2. Great for a cup of coffee or tea! Comes in “Small” and “Mega”. Ships worldwide! Call TOLLFREE (US) 877.809.1659 and give the operator the product number or order online by clicking the product number link below and size desired. Black color-changing mugs available in small only and are heat sensitive. The color-changing mug starts out all black in color. Simply add any hot liquid to the mug and watch as the mug changes from black to white and your unique design is revealed! Now that winter type weather is over-at least here in Florida, there’s nothing like a drive through the country in the jeep. Just fire up the old gal (the jeep that is) and go!! Sunny weather is here in Florida. Of course, it could just as well be pouring rain. 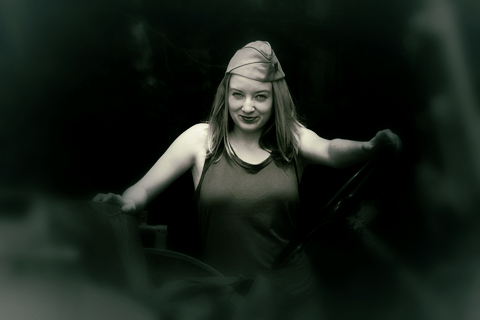 Either way makes for a wonderful drive in the WW2 Ford GPW. Jill is all set for a drive to go on a picnic. Your oil is important. Army Jill made sure the oil level was up to snuff and that the brakes would actually stop the four-wheeled beast before taking off. All was in readiness and we had an enjoyable drive. 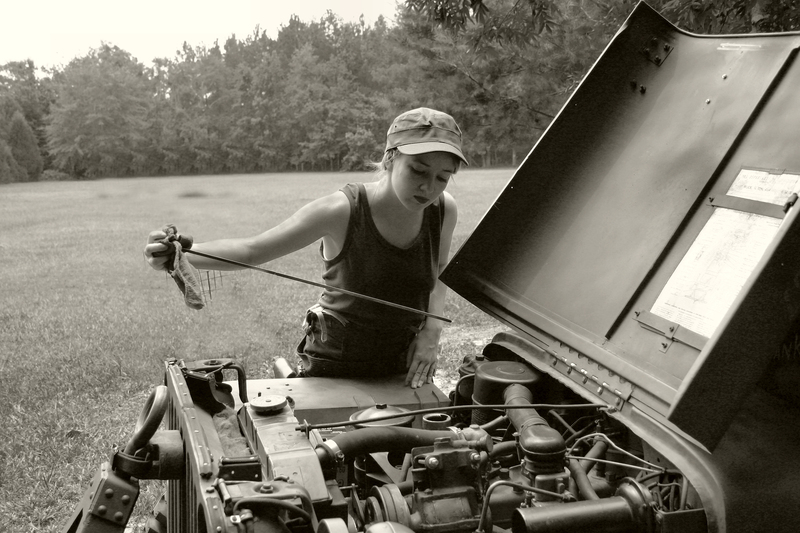 If there was any trouble she would refer to the two troubleshooting books that she always carries with her in the jeep — Automotive Trouble Shooting for WW2 Wheeled Vehicles: Volume 1 and Automotive Trouble Shooting For WW2 Wheeled Vehicles: Volume 2 .